Thanks for those shaders, they look impressive. I see a diagonal line on the pixel grid with dmg-6x.glslp and gb-pocket-6x.glslp. It doesn’t appear at scale 5x and below. Any idea of what this could be? Another problem is that gbc-5x-fallback.glslp and gbc-6x-fallback.glslp produce strange resolutions. 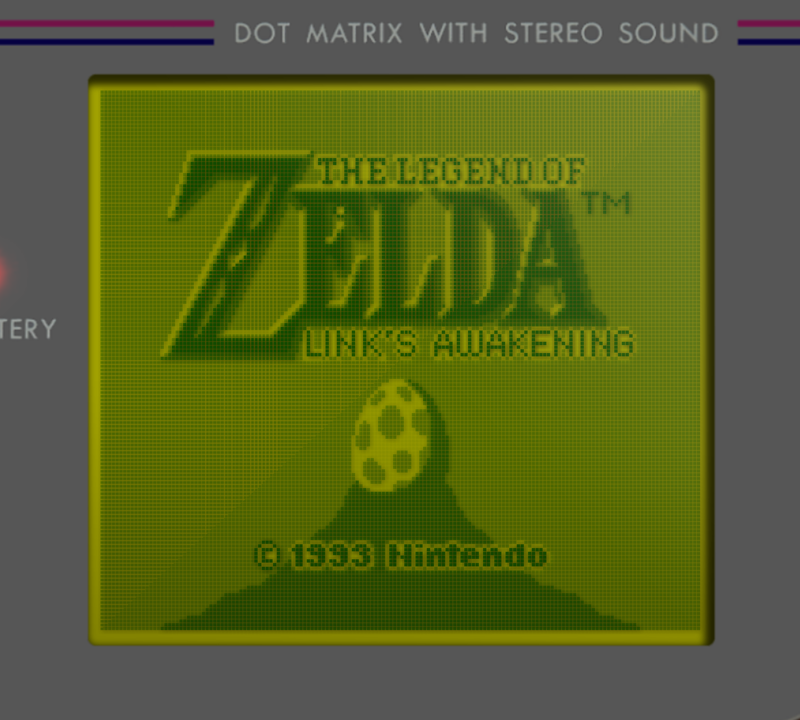 For example, with gbc-5x-fallback.glslp the console screen takes 1000 x 900 pixels. 4x and below behave the same way as non-fallback. Is there a way to display the entire borders uncropped? This diagonal thing usually happens when there’s no linear filtering on the end result. I’m not sure about anything concerning the glsl ones. I just worked and tested the cg versions, so they can have problems I ignore. I have linear filtering disabled. The diagonal thing doesn’t appear on the cg shaders, but the scaling of gbc-5x.cgp and gbc-6x.cgp is as strange as for gbc-5x-fallback.glslp and gbc-6x-fallback.glslp. Old versions are in “resources\old version” folder. edit: Remade the GG border to be a bit flashier. edit2: Reworked WonderSwan too, it was too bright. Added a WSwan overlay for vertical games (1080p landscape) in the Extras (1st post bottom). edit3: Remade all of them. Everything is on 1st page. For those who use GLSL only, I did some fixes to them on the shader repository. Guys, is it possible to port the fallback versions of these shaders to vulkan? It’s literally all I need to change all my retroarch use to vulkan. Thanks! You shouldn’t need fallback versions with vulkan, IIRC. Can you paste your shader error here? Oh I’m not getting any errors, it’s just that the fallback versions are way brighter than the default handheld shaders. They resemble the way GBA games look on a DS screen, way more vivid colors. There’s not any other of adjusting brightness as far as I know, right? Now the fallback sahaders disappeared for me. Were they removed from the latest build? I don’t actually know which fallback shaders you mean. Can you paste the contents of one of the fallback presets here? Here they are. I can’t find these in the latest version anymore. Oh, ok. That’s easy enough to reproduce. Just load up the regular ones but then go to pass0 and change it to use lcd3x instead of lcd-grid-v2. Hum this is what I’m getting in the regular ones. I’ve tried changing the lcd-grid to lcd3x but nothing changes after applying the changes. Sorry for bothering you with this and thanks a lot for helping! 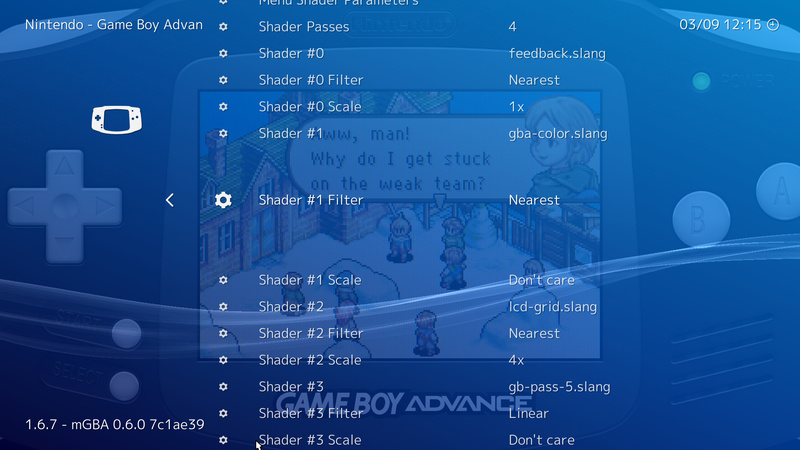 maybe it’s the gba color shader you’re not liking? it does significantly dull the colors. Try just replacing that with stock.glsl. Or could be that what you want is an image adjustment pass (shaders_slang\misc) between lcd-grid and gb-pass-5 with a luminance parameter of 1.2. 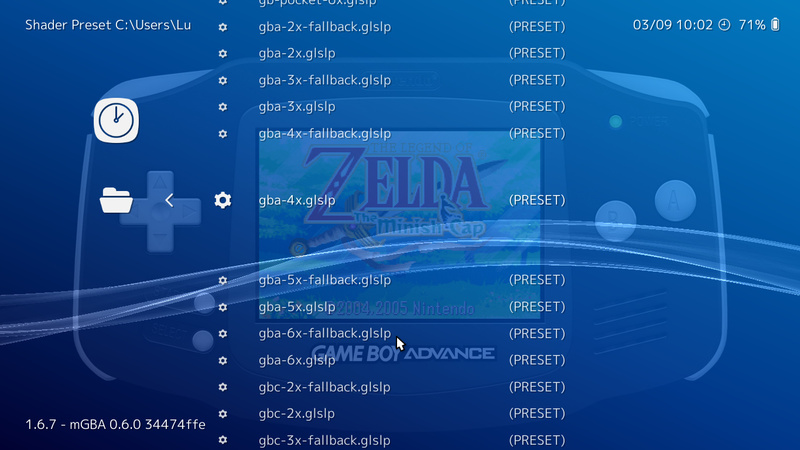 I’ve tried, but whenever I select gb-pass-5, retroarch crashes. Oh well, guess I’ll just use the preset the way it is. -making the last pass linear to avoid bad scaling artifacts on some resolutions. Thanks to Hunterk, slang and glsl GB shaders got rewritten to mainly fix an issue with the dots disregarding the color palette before (GB dots were black instead of blue/green on top of background). All presets have been updated in the repository and should look similar for all standards: cg, glsl and slang. That’s the ones you get when hitting the Online Updater in Retroarch menu. Hi, I’m very new at this scene and please excuse me if this is not appropriate question here. I notice there are some kind of light effect at the top-right corner of actual game screen. It is cool, however sometimes I want to turn it off. What should I do? Thanks in advance. It’s part of the png borders. You need to open them in photoshop and erase the light effect part to make it transparent. Sorry i know it’s late. But is there any way to get the gba shaders work on the latest Retroarch? 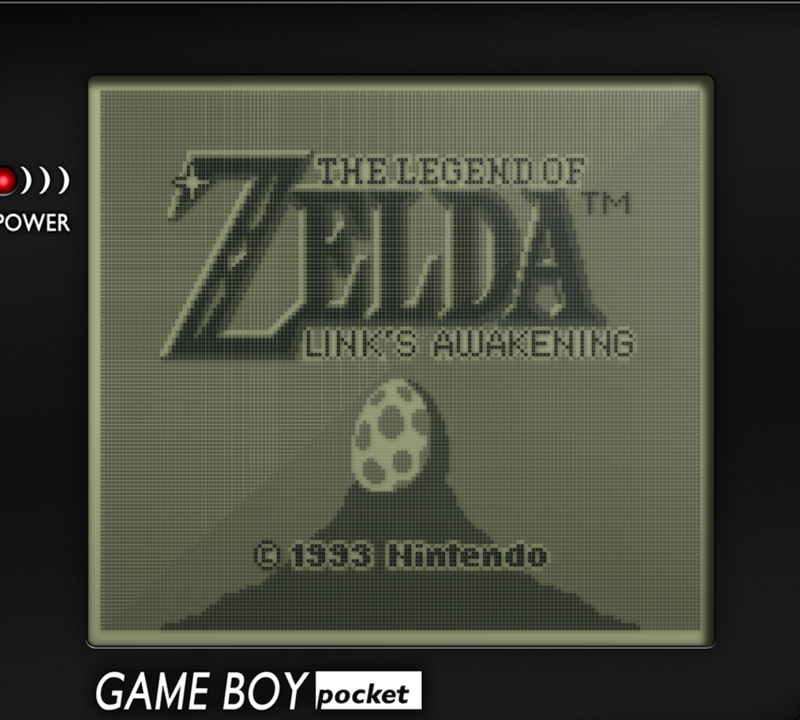 For some reason GBA-LUT (which i want) refuses to load. If i select it nothing happens.